Wonderful graphic! Are you going to do these for all practice standards? Thanks, Jessica. Jennifer and I are working on this together. Sam gets lots of credit for coaching and brainstorming with me for the doodles. If you use it, will you send me a photo of how/where you used it and the reaction from learners? Love these! I will experiment with them in my Fourth Grade classroom. Feedback will follow soon! Thanks for sharing! Yay! Thank you, Kato. Sam, Jeff McCalla (St. Mary’s in Memphis), and Jennifer are also going to use them. Feedback from multiple places, schools, and age ranges. I love this for students! I think it is especially important to try to get students (and parents) to move away from the numbers as they imply a “grade,” and I think having a visual is the key. I wonder if it would be helpful to have a visual that students could easily replicate on their work–like a self-assessment before it goes to the teacher. So, a student does something, draws a quick visual (or places a quick stamp), so that the teacher immediately gets an idea of how the student feels about where he or she is at that point in time. On another note, I have been pondering about the levels. When they are set by teachers, it appears that they are always set so the goal is Level 3 with some description of what the different levels are. 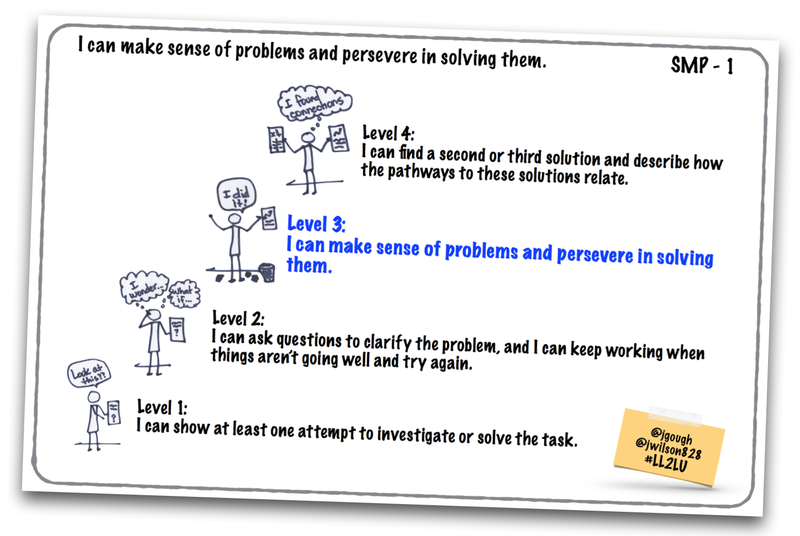 Is there ever a time when we want students to achieve a level other than 3? Could it be helpful with a brand new concept for students to have the expectation (from themselves and the teacher) that the goal (for today, this lesson, etc.) is to get to Level 1? Then, in subsequent instances, the goal is to move up to Level 2, then Level 3?